EA SPORTS Active™ is a new customizable fitness program. Read on to learn all about its incredible benefits and see how they work together to help you reach your goals, from the comfort of your home and on your own terms. Featuring more than 25 exercises and sports-inspired drills. See your movements tracked on-screen with the specially-designed leg strap. * Additional leg strap required for multiplayer use. Increase the intensity of bicep curls, shoulder presses and many other exercises. * Additional resistance band required for multiplayer use. The accessory pack containing one leg strap and one resistance band can be purchased at retail stores or online for $19.99. Kids need to play and being outside is great, until it rains or snows, to cold whatever. 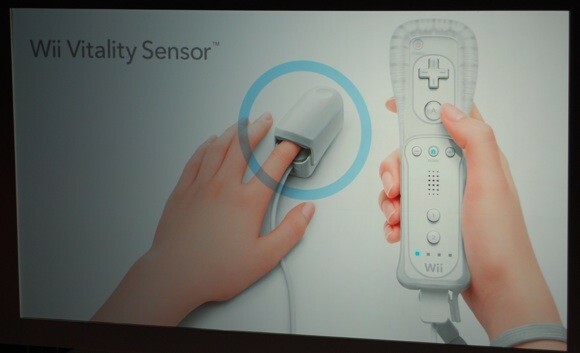 Wii Fit has brought it to a whole new level with Vitality sensor. The add on sensor clips on to your finger and monitors your heart rate, this opens up a whole bunch of cool things that can be done. Doctors with permission can have children do Wii Fit games them upload vitals to the office for docs to evaluate. The ideas and apps are endless. Get the obese kids on the Wii start to develop games and add ons and lets see the obesity rate fall. The next best thing to getting one to exercise outside is the Wii Fit. Lets face it some are just to embarrassed to exercise in public, self conscious or just don't have the money to join a gym. Playing online games allows many to be something else (leave it at that). The most important thing is that they are exercising and Wii has nailed it and now XBox Natal has taken it a bit further, tie it all into a online PHR/EHR and the results are expounded. Dose Of Digital is right on what I have been trying to get across for sometime, maybe it is starting to take hold. One of the best pieces of equipment that you could own is the DynaFlex Pro Gyro it is small and give you a burn that you will not soon forget, Plus you the size make it great to travel with. Physicians and Therapists all over the world are using the DynaFlex Pro Gyro as a rehabilitation and strength-training tool for many of their patients. The gyro exercisers are a proven tool that will help aid in the prevention & elimination of Carpal Tunnel, arthritis, tendonitis, tennis elbow and many other Repetitive Stress Injuries (RSI). The patented Dynaflex Pro Gyro exerciser is designed exactly like the Powerball Gyro without the LED lights or the balanced rotor. The Gyro can reach up to 9,000 RPM and creates 25 lbs of torque resistance to increase grip strength, increase range of motion, and to condition arm, elbow, and shoulder muscles.